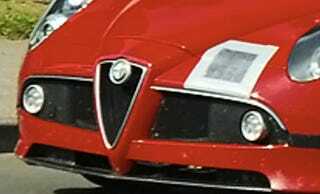 Rumor has it that Alfa Romeo will be building a special 8C supercar dubbed the GTA to celebrate the company's 100th anniversary, and one reports suggests that this lightly taped mule seen near the Nurburgring is that car. What makes this red 8C different from any other 8C? The exhaust note has been described as "darker," which would aptly describe the Ferrari California's 4.3-liter direct-injection V8 that reportedly powers the rumored 8C GTA. Whether or not the GTA actually sees the light of day, we'd love to see additional speculation just for an excuse to post more 8C pictures.